“Some of you don’t like me. Some of you don’t like the Army. 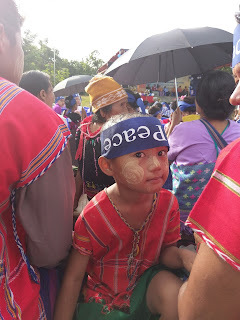 Some of you don’t like the Karen National Union. But that’s OK. We all have to live together”. The Bago Region State Minister had just summed up the status and sentiment of the peace process in this part of Northern Kayin State, Myanmar. 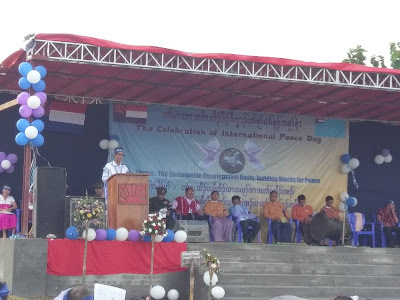 Today was International Peace Day, and I was privileged to share it with two of the World’s longest military adversaries: Myanmar’s military (called the Tatmadaw) and one of the many Ethnic Armed Organisations (EAOs) in Myanmar who have fought them since the late 1940s, the Karen National Union (KNU). I was here with Saferworld, for whom I work, and some of our partners working on the promotion of women’s role in the peace process. Some areas of Karen are controlled by the Government. Other parts are controlled by the KNU. Having woken at dawn in Taungoo Township, itself under Government control, we journeyed off road for an hour through misty villages already well awake with the hard graft of farming. The dirt track got narrower, bumpier and more remote. And all of a sudden the odd soldier lining the route had a different insignia on their arm. We had crossed into KNU territory. But this day was different. 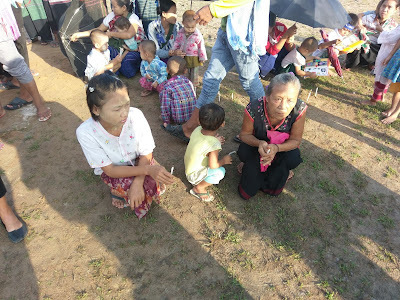 Karen civil society had painstakingly negotiated permissions to enable senior Government officials, Tatmadaw officers and even the Myanmar Police to cross into this area, attend and take part in a Peace Day event in front of several hundred villagers, who have borne the brunt of this conflict since before independence from Britain. Even at 7am the sun was brutal but so were the people’s determination to sit there, sweat and listen to what these men had to say. And yes, they were all men. But it was not lost on anyone that it had been women, working behind the scenes and among their communities, who had brought them to the stage itself. The Commander of KNU’s 2nd Brigade spoke alongside the Tatmadaw officers. Both signatories to a ceasefire since 2012, but their polite mutual applause did not disguise how far remained to travel. In fact all of the speeches were conciliatory and the applause uniform. But what has struck me most in the conversations with those peacebuilders who have done so much to bring us to this point is how long and bumpy it will be before there is long term sustainable peace here. 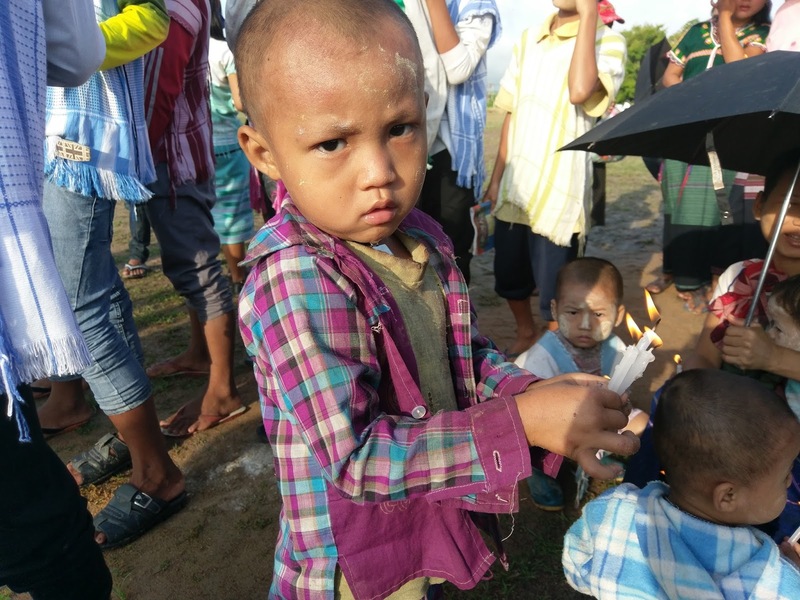 The sheer depth of antipathy, lack of trust in any part of the State by many, and the long term social impact of decades of violence will take generations to overcome, so that Myanmar can start to reach its potential. Those of us wishing to support from the outside – donors and practitioners – have to start from a point of humility. We do not have the answers. They do. There are real opportunities but there is one simple metric to apply: will it be people-led instead of Government-centred? If the answer is no, it’s time to think again. It was notable that behind the dignitaries the poster quoted the Sustainable Development Goals (SDGs) and stated that they were collectively “building blocks for peace”. Donors, UNDP: are you listening? That is real people telling us what they want the SDGs to mean in their realities. 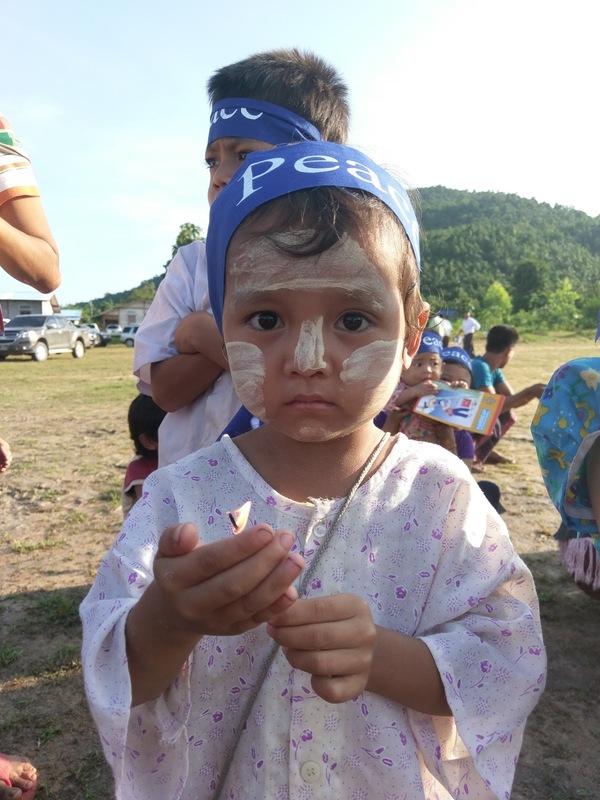 There are already proliferating SDG initiatives in this country that do not relate to building peace, but other agendas pre-determined by some donors and the government instead. Time to think again. Myanmar is about to embark on a process in which some form of federalism will be debated as a future governance settlement to bring the fighting to an end. But there are multiple and competing definitions of that federal state, and not every EAO has signed a ceasefire. Heavy fighting is currently taking place in different areas of the country. 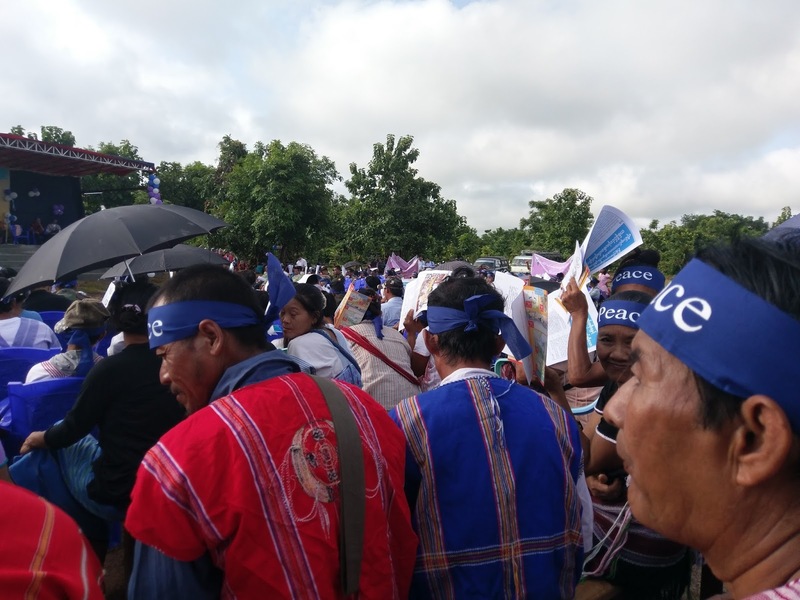 The momentum and genuine hope created and sustained by Aung San Suu Kyi is real reason to hope that these factors can be navigated and a more inclusive process can take shape. But it would be a profound mistake for outsiders not to place support for building peace at the centre of any and all of their strategies here, and to support the chances of peace by shaping those strategies from the bottom-up, listening and learning from what communities living in villages like this will gladly tell you about, if only they are asked. Peace will not ultimately be secured at a grand signing convention with world leaders looking on. It will be won or lost in these villages, with real people deciding if they have built enough trust in their former adversaries to begin to build together. What today proved was that those people want peace. They showed that standing under the sun. From all generations. Holding candles. Gently scolding bored children. Wearing banners on their heads. They made sure their voices were heard today by those men who bear arms and wield power. That is their victory and what peace day is all about. 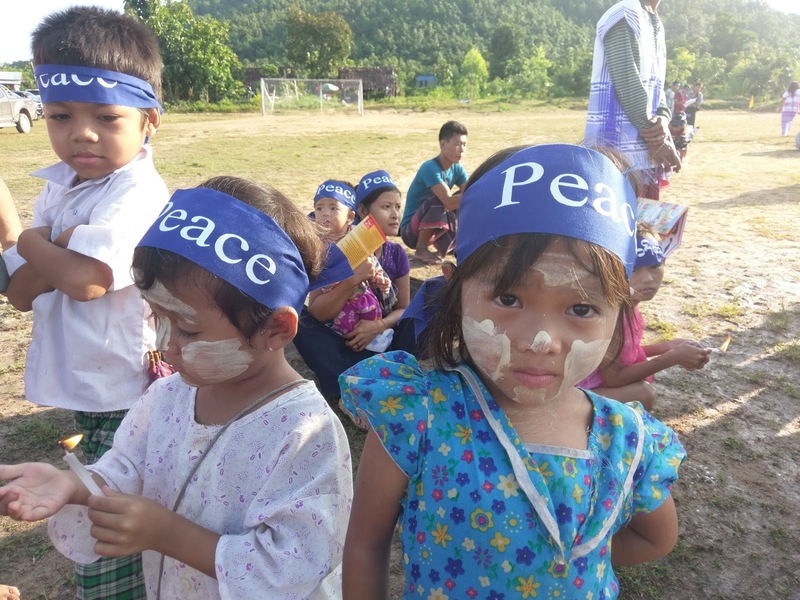 An even bigger victory would be for their voices to be heard, listened to and acted upon by those who will celebrate peace day later today at the UN General Assembly in New York, or in the capital cities of donor agencies as priorities are set. Or is that too much for them to ask?